In 1783, hot air balloons became the first viable option for people to explore the world from the sky. In the years since then, balloon flight technology has evolved from cloth balloons and open baskets to polyethylene balloons and metal pressurized gondolas that allow for high-altitude atmospheric exploration. Beginning in the early 1930s the United States Air Force began making forays into the atmosphere using balloons, and what followed laid the foundation for NASA and all American space exploration to come. On July 28, 1934 the United States launched Project Explorer -- one of the country's first attempts at sending men into the stratosphere in a balloon. 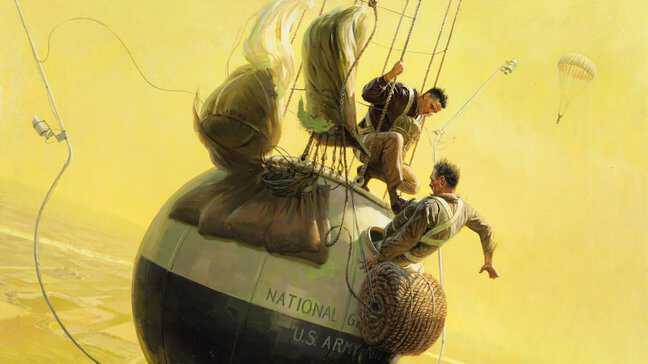 During Explorer, the United States Army Air Corps and the National Geographic Society hoped to send three Army Air Corps officers to a record 75,000 feet. The balloon weighed over 5,000 pounds, with two and a half acres of cotton fabric glued together using 300 gallons of rubber cement. Lifting the contraption required 3 million cubic feet of hydrogen, an extremely flammable gas. The flight ended in disaster when the balloon ripped, plummeted towards earth, and burst into flames less than a mile above a cornfield in Nebraska. The pilots managed to crawl out of the gondola and parachute safely to the ground. The balloon had been packed incorrectly, causing the pieces to stick together and tear once the balloon was fully inflated. By 1935, engineers had made significant developments for Explorer II. For the first time, they opted to use helium as a lifting gas. Helium was non-flammable and thus a safer option than hydrogen; however, it only had 92% of the lifting capacity of hydrogen, so a larger balloon was required to lift the men and their equipment. The Wellington Sears Company provided the cotton cloth fabric for the balloon, and the Goodyear-Zeppelin company assembled it in Akron, Ohio, using similar techniques from the construction of the Explorer I balloon. They cut the material for the balloon into its major pieces, passing each piece through a rubberizing machine several dozen times to make it pliable and easy to manipulate. The pieces were then glued together, using hundreds of gallons of rubber cement. The seams were reinforced on both sides with fabric-backed rubber tape. It was the biggest balloon anyone had ever built, with a volume of 3.7 million cubic feet, and weighing 6,500 pounds. When fully inflated, the balloon had a diameter of 192 feet. On November 11, 1935, Air Corps Captain Albert Stevens and First Lieutenant Orvil Anderson went up in Explorer II and reached a record height of 72,400 feet. The flight was a resounding success, but the balloon technology had reached its limit. In order to conduct flights further into the atmosphere, engineers would have to develop a new kind of balloon -- one that was both lighter and more durable at extreme altitudes. Winzen Research Inc. in Minneapolis, Minnesota took on the task of developing and manufacturing this new balloon. German-American aeronautical engineer Otto Winzen and his wife Vera ran Winzen Research. Otto had gotten his start at General Mills Inc., where he was the chief engineer of the company's new Aeronautical Research Division. General Mills had a history of aiding the military with research assignments and created the Aeronautical Research Division specifically to develop plastic balloons for the Navy. While at GMI, Winzen obtained his first patent for new system of balloon manufacturing, using heat-sealing technology and new load tapes, which would better carry the weight of the balloon. 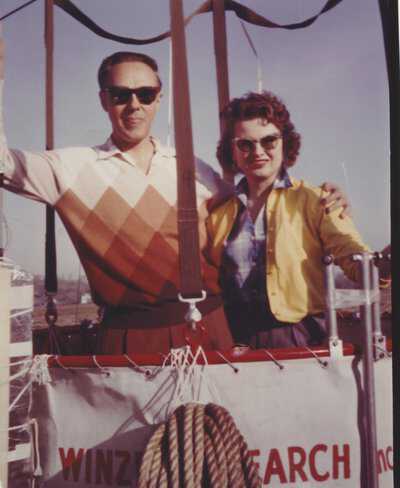 In 1949, Otto and Vera founded Winzen Research Inc. to better develop their own plastic balloons. Shortly thereafter, Otto pioneered the use of a polyethylene resin in the manufacture of his balloons. The resin was produced from ethylene, a petroleum derivative, and was used to adhere the individual pieces of plastic together to form the balloon. The polyethylene was light, fairly inexpensive, and unaffected by ultraviolet radiation, making it ideal for travel above earth’s atmosphere, where ultraviolet radiation is stronger. To make the balloons even thinner and thus lighter, Winzen convinced his suppliers to make their plastics slimmer. He was able to get the material so thin that the plastic measured only .002 inches thick. 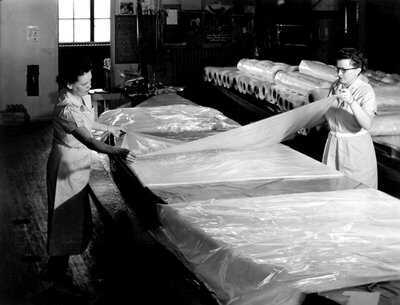 During the manufacturing process, the balloons were laid out on long, thin tables. One section of the balloon would be sealed by running a heat sealer down one edge, it was then attached to the next section, sealed, and so on, until the balloon was complete. The polyethylene the balloons were made of was so thin and fragile, "balloon girls" worked in stocking feet and checked their fingernails every morning to make sure nothing on them could tear the balloons. Vera Winzen acted as vice-president and chief of production at Winzen Research, also managing the facility, the personnel, and the production process. She was constantly improving the construction and design of the balloons, and she developed new systems to ensure consistent quality in Winzen products. During her time at WRI she obtained four patents and was a central figure in the planning and execution of Air Force and Naval manned research flights. She played a major role in the development of high altitude gas balloons, and she was recognized as the finest plastic gas balloon builder in the world. In 1957 she represented the United States at the 30th Annual International Gas Balloon Races in Holland, receiving a gold medal for her contributions to gas balloon research. In 1956, Winzen Research created the balloons for the U.S. Air Force's new balloon flight program, Project Manhigh. 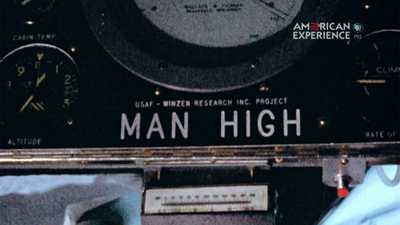 The U.S. Air Force began work on Project Manhigh in December 1955 in order to determine the human limits of space flight. 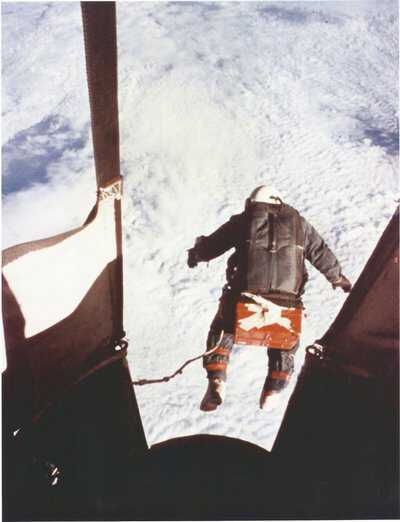 The goal was to take men up into the stratosphere and investigate the limits of human survival in space and how to improve their aluminum-alloy capsules, called gondolas, as well as the impact of cosmic rays on the human body and essential equipment, so that high-altitude explorers could be better protected from the harsh atmosphere at high altitudes. They also wanted to study how the balloon reacted to an environment above 99 percent of the earth's atmosphere. By the fall of 1956 WRI had completed the first Manhigh balloon, and the capsule that would hang below it was well into production. Winzen's thin polyethylene balloons were more flexible than the older cloth balloons, making it easier for pilots to control their elevation. Winzen Research balloons would be used for all three Manhigh flights, and allowed aeronauts to reach unprecedented heights, enabling the Air Force to study the effects of high-altitude flight on humans. 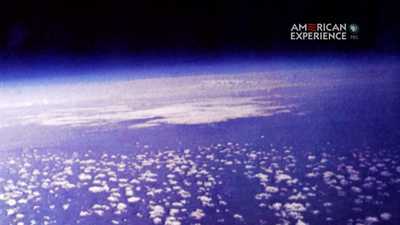 Project Excelsior was one of the Air Force's last high-altitude balloon experiments. Excelsior was a series of three high-altitude bailouts that were designed to test a new kind of multi-stage parachute that would solve the problem of "flat-spin" -- the dangerous and sometimes deadly high-velocity spin that pilots experienced in high-altitude emergency evacuations. On August 16, 1960, U.S. Air Force Captain Joseph Kittinger went up in an open gondola hanging from a polyethylene balloon. At a height of 102,800 feet -- a new altitude record -- Capt. 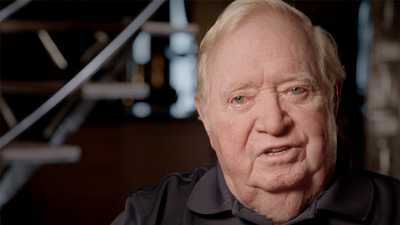 Kittinger jumped from his gondola. He survived the longest free fall and the longest parachute jump in history, falling nearly 20 miles in 13 minutes and 45 seconds. The National Aeronautics and Space Administration (NASA) was established in 1958, and by 1960 it had taken over as the country’s foremost space exploration agency. But without the pioneers of the U.S. Air Force’s Balloon program, NASA may never have achieved all that all that it has to date. In the 1950s and '60s, Captain Joseph Kittinger was a test pilot for the U.S. Air Force's high altitude balloon experiments.